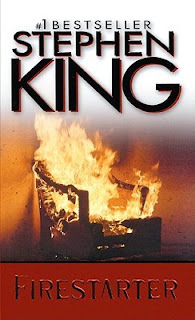 Stephen King's child-savant strikes again--this time with immolation! Burn, baby, burn! Fire-Starter is the story of Charlie McGee, a young girl, protected by her father who is trying to get her help before she can do something catastrophic. Like burning someone to death instead of singeing their feet or blistering their face. Not that the latter are minor, mind, but you know, burning scads of people during a tantrum isn't something you can easily explain to the police ... or the evil government organization that wants to cut open your braaaains! But more on them in a bit. The relationship between Charlie and her father, Andy, is the best part of this book. King really excels at parent/child relationships, be they good or bad. He notes in the end that his daughter helped him understand what it would be like to be a girl Charlie's age, so that personal connection made the relationship and Charlie's character much more convincing and touching. When Andy was in college, he and the woman who would become Charlie's mom participated in a psychological experiment on campus for some extra cash. They thought they would get a medically-induced high and a few hundred bucks for their trouble. Instead, Vicky and Andy survive the experiment and gain some very peculiar abilities. Andy can "push" people--making them do what he wants. Vicky has a mild case of telekinesis. And the doctor who experimented on them is associated with a deep black government organization called The Shop. Vicky and Andy pass on their abilities to their daughter, Charlene, realizing with horror that she is an asset that The Shop would very much like to tinker with. After The Shop murders Vicky, Andy and Charlie go on the run, with Andy pushing his abilities to the limit and inching closer and closer to a stroke. Meanwhile, The Shop deploys its deadliest assets to capture the fugitives, including an unhinged assassin named John Rainbird. I really disliked his character. Fire Starter was published in 1981, and you can feel the weird, lingering aftereffects of the 1970s in it. Part of that is the strange faux-PC treatment of Native people. John Rainbird is Cherokee, but his family land is somewhere in the Southwest (I didn't think the Cherokee Nation had lands there, but you know ... geography and all that jazz pales in comparison to just making crap up). He talks about how "being an Indian" makes him good at being quiet and hunting and all the stereotypes white people have created about Native people. He's also a psychopath who feels no emotion except for a strange fulfillment every time he kills people, which is quite often. He fixates on Charlie because he thinks that killing her will show her what happens after humans die. Look, I'm not saying this makes any sense. Au contraire! But I tell it as I read it, guys. Anyhoodles, between the caricature of the Evil Indian Nam Veteran and Andy's incessantly heinous decision-making, Fire-Starter often exasperated me. But I kept reading. I liked Charlie. I rooted for Charlie. And I think, in the end, she got the ending she deserved. If you have the chance to read a different book by Stephen King, do it. If you must read Fire-Starter, I won't stop you (obviously, since I'm on this side of the screen and you're on that side), but it's certainly not his best.